Another very rewarding thing since I’ve started blogging is all the wonderful friends I’ve met from around the world. I’ve connected with the sweetest people from New Zealand, London, Singapore, Australia, etc. And then there’s Becky from Japan. I first ‘met’ Becky when I was searching for vintage Chanel’s on Etsy. Luckily, I stumbled upon her shop. It’s truly a diamond in the ruff. After emailing back and forth, I soon realized that Becky and I had one huge thing in common. She’s from Boston! But not only was she so sweet personally, her strong business ethics really stood out to me. She addressed every single concern I had so promptly and professionally. And thanks to Becky, I’ve found the ‘one’. My vintage Chanel that I’ve been searching for for eons. And because I was so happy with my experience, I want to introduce you to Becky and her shop, www.etsy.com/shop/eNdApPi. Sharing is caring! If you are a handbag lover like myself and are in the hunt for unique, authentic Chanel, Hermes, etc. pieces, check out Becky’s shop HERE. If you peruse Becky’s site, you’ll find pieces that you won’t find anywhere else. Her collection is amazing. Compared to other sites which sells vintage pieces such as One King’s Lane or Gilt.com, her prices are extremely competitive. And if you are worried about authenticity, she guarantees all her bags to be 100% authentic. In fact, she’ll encourage to get your bag authenticated by a professional third party authentication service or at your local Chanel if you have any concerns. You should also check out her store’s 300+ reviews which all are 5 stars! 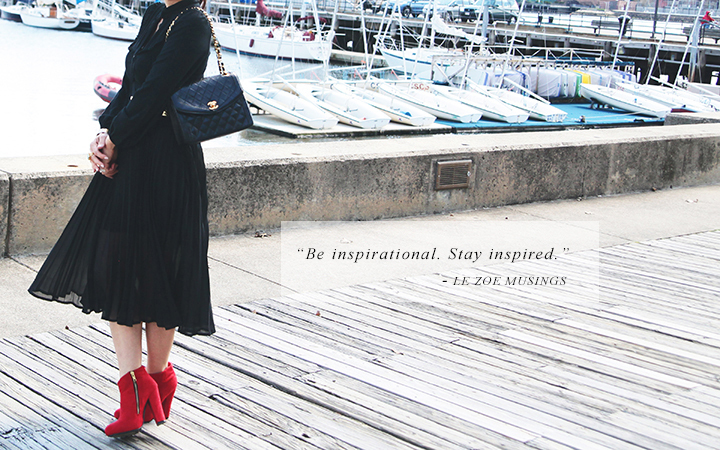 Becky has been SO kind enough to extend a special one time discount to Le Zoe Musings readers. Please enter the code ENDA10 for 10% off! Love Love Love your bag!! Perfect in combination to your outfit.. Yes, the uniqueness and creativity of this blog is what keeps me coming back. Keep up the inspiring work! I have to agree with you on that one note – blogging has not only brought me joy but also the opportunity to get to know new friends and connect with their world and what makes them tick. For me, broadening my view on the world through the eyes of other bloggers around the world and being able to make friends with them is by far, the most rewarding experience of blogging. Crazy as it may sound, but it is absolutely true with what one of your readers mentioned here, woman today plays so many roles that it is not easy to come by a blog that really emphasizes on quality content, and one that you can tell the blogger has poured their heart and soul (and time, with the help of their better half, or little family for your case) into making the blog a great ready (visually as well). I am sure no matter what, for those who juggle family lives and work, we shall strive on to make our blog a great space to share great ideas and inspiration for passion for blogging is the one thing that keeps us from being complacent with our work, right? Also, this blog post on connections was really touching I loved reading it. Those red boots are fantastic! I really enjoyed this post! I’ve been following your blog from the beginning and you continue to inspire me. The messages from your readers were so sweet and sincere. I love this ensemble! It’s classic and sophisticated. 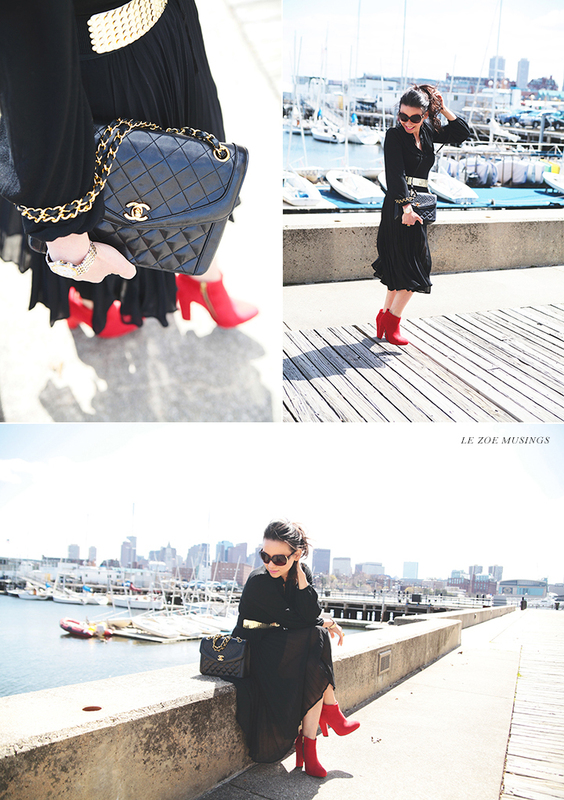 Adding the red shoes and classic Chanel handbag….perfection! Thanks for introducing us to Becky’s site. I will definitely check it out. Thank you for dropping by my blog I love it when people do because I then return the favour and get to see some amazing blogs such as yours.I just love the bag it’s beautiful. Loved the picture & this post! Just beautiful as always! Footwear, belt and bag – All three are an absolute winning combo. I’m from UK. I loved you bag! Thank you for the tip on her store, I have been looking for a vintage Chanel for what seems ages now! I’ll be sure to check hers! The boots!!!! Oh, was there a purse? Sorry, just groovin on the boots. I love your fabulous red ankle boots!!! Hi, really enjoyed going through your post! Super interesting, cool (and stylish!!) love your bag -Keep it up! Come and check out my blog, if you get the time; I’d love to know what you think!